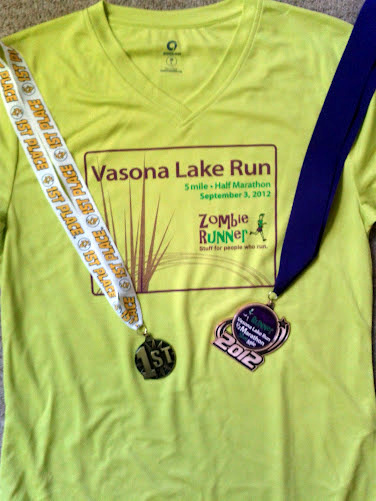 The ZombieRunner Vasona Lake 5 Mile was a super small community race in Los Gatos organized by Coastal Trail Runs/Zoom Running Events. 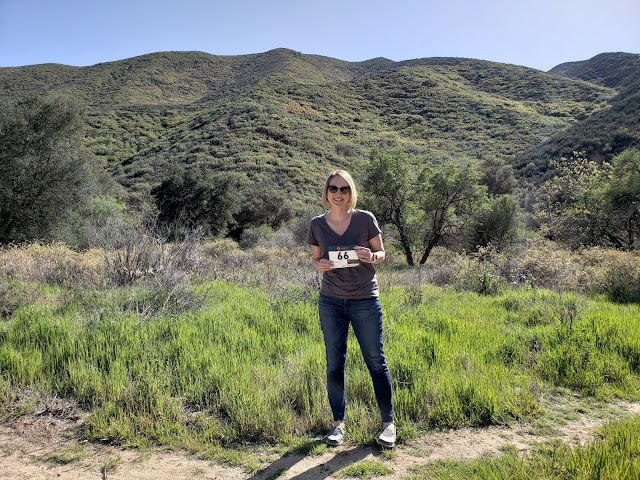 We started from Vasona Lake County Park and ran an out and back on the Los Gatos Creek Trail. I run on this trail a lot, but unless we are running 10+ miles we don't get down to this part of the trail. I enjoyed the low key, just for fun race a lot. Bib and t-shirt pick up started at 7 am and the race started at 8 am. There was also a half marathon distance, and the majority of runners were doing that. The weather was cool enough but not so cold that I wasn't comfortable pre-race in the singlet and shorts. I saw a few people that I met volunteering on Saturday and enjoyed chatting with them again. I'm loving the Coastal Trail Runs community. I met up with Oiselle Team member Sophia at the beginning, and she was easy to spot because we matched with our singlets, orange shorts and orange spike bags. 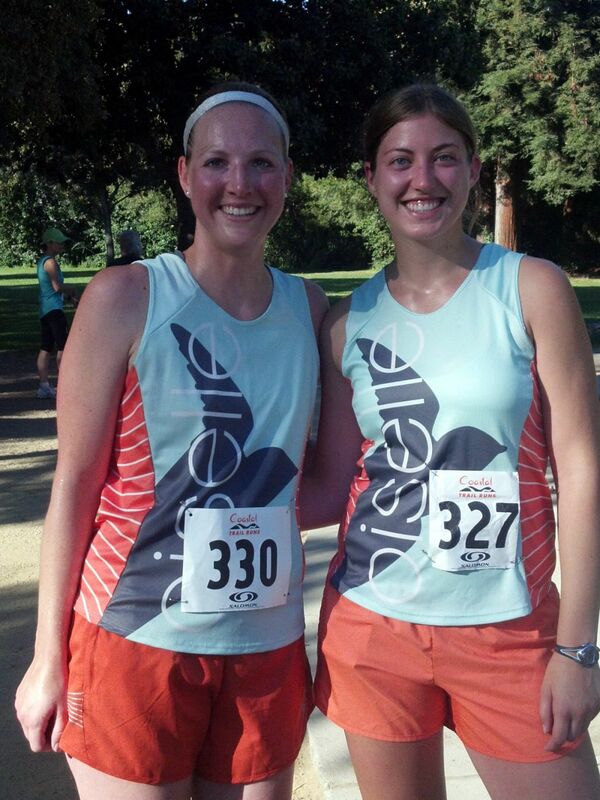 Gotta love the Oiselle orange! She's originally from the Bay Area and was visiting home this weekend. My goal for this was to PR, knowing this should be an easy 5 mile PR over the one from November 2010 (the last time I ran a 5 mile race.) I have run faster than I did that day even during training as well as during my last 10K PR in May. We had chips on our bibs, but there was only a timing mat at the finish so it was a gun start. It was a little crowded and I went around people on the grass to get going, but I don't think it slowed me down that much. I went out at a 9 minute pace and felt good holding it for the first 3 miles. I ran a great 5K and would have pushed mile 3 harder if it was actually a 5K. I wasn't sure that I could hold that pace for 5 miles but why not give it a shot, right? 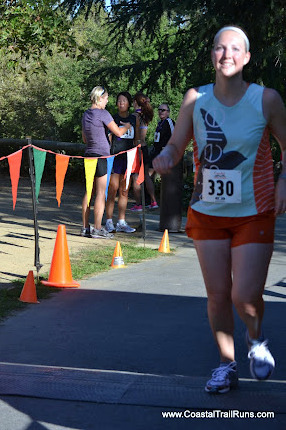 I was definitely feeling it by mile 4 and I backed off quite a bit knowing I had to 2 miles to go. I still kept close to my goal pace of 9:30 for the rest, so that made me happy. That said, this is the point where I need to learn to get out of my comfort zone and push harder instead of backing off to play it safe. I'm getting there, but that 'what if I can't finish without walking' thought still tends to show up. The course had a couple of tiny little hills but only an elevation change of about 100 feet up and 100 feet down. Nothing too exciting there. I enjoyed running the trail, and it was surprisingly easy to get around the racers and the normal trail users in the small race setting. According to the website, the final course is 4.8 miles and not quite 5 miles, which is sort of disappointing on the PR front but I knew that going in. It was most definitely a pace PR. Not a great finish photo, but you can download for free! Even more exciting? I won age group 30-39! I know it was a super small race and I was just lucky with the field...but I'm going to let myself be excited about that anyway. It's not often I get to enjoy a first place age group medal! The shirts for the race are nice gender-cut tech shirts, v-neck for the ladies which I love. The color is super bright and will be great for winter running in the dark, and the fabric is great. A good race shirt overall. We received medals for the 5 mile too which was a little weird, only because I don't feel like I earned a medal for 5 miles. But hey, who am I to turn down race bling? It can hang with my age group medal for this one. After the race, we had a Bay Area Oiselle Team meet up at a fantastic brunch place called Cafe Borrone in Palo Alto. I had eggs with spinach and feta plus a whole wheat bagel. Perfect post-race food. There was lots of relay and Hood to Coast talk going on...early planning perhaps? I hope so. Overall a super fun Labor Day! Awesome! Great race and congrats on placing! Congratulations on your result. I am wondering what was the Zombie aspect of the race. Also enjoy the medal, it is fun to win one. Thanks! ZombieRunner is the running store who sponsored. :) No actual zombies to speak of. Congrats on your age group win and PR! congrats on an awesome race, paulette! your times are great. i wish we could run together, as our times are very very similar. i bet we could push each other to many PRs! 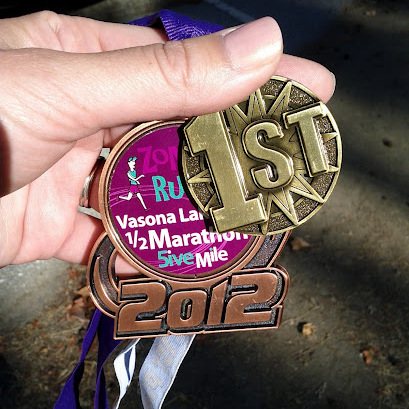 :) your race has many parallels to the 5k i ran saturday. i'm working on that blog post now, and would be curious if you find the same similarities! I agree - I've thought the same about our times before. I'll make sure to find your post! I'm so excited you won your age group!!! Not luck... you ran PR pace and deserve the win!! Congrats!! !